Welcome to my web site about 66 Squadron Royal Flying Corps and Royal Air Force in the First World War. I have been researching 66 Squadron since the late 1980’s when I became interested in Harry King Goode, DSO, DFC, AFC. I spent many an hour at the Public Records Office in Kew and the fruit of my research was published in Cross & Cockade International in 1993. This web site is the result of some of my research. My interest has always centred on the people rather than who got who, and I have spent some time contacting some of the families of the not so well known names. They came from a wide range of backgrounds and many came from other countries of the Empire. Canada is very well represented, along with Australia, New Zealand, U.S.A., South Africa, Ireland and Argentina. The Officers were in the main quite young; most were born between 1890-1895, so in 1918 they were aged between 23 and 28. There were some notable exceptions, E V ffrench and F D C Gore to name two, both of Australian backgrounds. The enlisted men’s age varied quite a lot with men born in the mid 1880’s through 1896. The majority of the enlisted men were tradesmen such as carpenters, welders, riggers, airframe and engine fitters, electricians, others were in a support role, cooks, batmen, drivers etc. Englishman Capt. James McCudden V.C., D.S.O. and Bar, M.C. and Bar, M.M., and Croix de Guerre, served with 66 for a few weeks in the summer of 1917 flying the squadron Sopwith Scouts. He was awarded the VC whilst serving with 56 squadron in April 1918 only to die a few weeks later. Canadian Major William G. Barker V.C., D.S.O. and Bar, M.C. and two Bars, C.C., Legion d’honour, Croix de Guerra, Medal d’Argento was Canada’s most highly decorated member of the RFC/RAF. He served with 66 as a flight commander from April 1918 until posted to 139 Squadron as Commanding Office in July. He returned to Home Establishment and was later sent to France where, whilst flying a Sopwith Snipe on the 27 October 1918 of 201 Squadron he was involved in combat and awarded the VC. Finally Englishman Lt. Alan Jerrard was awarded a V.C. for the action he took part in with Capt. Peter Carpenter D.S.O. and Lt. Harold R. Eycott-Martin all of 66 squadron on the 30 March 1918 when attacking Austrian Mansue aerodrome. After the war some of the men would return to their pre war employment, some including John Whittaker, Harry Goode and Owen Boyd stayed in the RAF, only to die in colonial and other wars including WW2, Richard Ryan helped found a new company in aviation, which grew into a major international airline. Gordon Apps joined the fledgling Canadian Air Force and was involved in the photographic mapping of that country. Others retained a link to the forces; Robert Capon retired from the RAF in 1925 after serving with the Reserve. He became the Superintendent of Scientific Research at Farnborough, Cecil Morley joined the Civil Works Staff eventually serving in Germany during the 1950’s Cold War. The biographies section will be added to as time permits. The squadron was also unusual for the esprit de corps that was generated when John Whittaker took over command in the winter of 1917-18. He introduced a squadron magazine called “Clickerty-Click”. Inter-squadron sports were organized including, Water Polo, Football, Tennis and Cricket, and no doubt some of the men helped with the theatrical productions put on in 1918 by 34 Squadron. At the latest Spinks medal auction held in London on 22 July 2010 the medals of Group Captain Charles Midgley Maud, R.F.A., R.F.C. and R.A.F. were auctioned. The medals had been properly mounted and not in the condition I had found them in December 2009. The group comprised his DFC, 1914-15 Star, BWM, VM, WW2 Defence medal with MiD, Special Constabulary Long Service Medal and the Crocce di Guerra. Other items included were his R.F.A. Officers sword, dress miniature medals and four photographs. The lot was sold for £12000.00 before tax. Maud joined 66 sqn on 8 March 1918 and was posted to A flight and whilst with the squadron he was credited with eight victories. After WW1 he became a wool broker and rejoined the RAF in 1939 as a Flying Officer with seniority dated 30 August 1938. The RAF did not use his original PI number issued in WW1 (14795) but a new one, 72708. Recent new find was the Royal Aero Club Aviators membership card belonging to 2/Lt Thomas James Lethbridge. Lethbridge who was born in South Zeal and lived in Sticklepath, Devon was killed on 25 September 1918. Lethbridge originally joined the ASC as a Pte Driver in May 1915 and went to France on 15 June 1915 where he was attached to 23 Anti Aircraft Section, later he was posted to J Corps Signal Coy. Thomas joined the RFC on 14 May 1917 at South Farnborough and after flying training joined 66 Sqn on 22 June 1918 in Italy. On the 25 September he led an Offensive Patrol which departed at 13.10 along with 2/Lt Augustus Paget and 2/Lt Charles C Butler, on his return to the aerodrome he hit a tree and crashed in to an adjoining field, he was still alive when they got him out but died later in hospital. He is commemorated on the Sticklepath village war memorial which is on the old village school wall. My project to compile a 66 Squadron Chronology is underway. I am setting out what the squadron did from day to day and trying to add in as much information as possible based on official documents mainly from the National Archives, Log books, published and unpublished memoirs. I am on the look out for photographs of any Officers and men who served with the squadron between 1916-1919 and any aeroplanes that was used by the squadron in WW1. I am also interested in copying any ephemera (including log books) related to the squadron such as letters, newspaper clips and other documents for the 1916-1919 period. If you think you can help just contact me through the web page and I will get back to you ASAP. The end of the Austrian-Hungarian War in Italy 1918. In late October 1918, the Austrian-Hungarian forces were in such a dire place, that the forces commanders were actively seeking a cease fire; negotiations had been taking place during late October, then on the 28th the Austro-Hungarian forces attempted to obtain a truce, although when the Allies produced a document, which was put before them, they were very reluctant to sign the armistice document. In the meantime the Italian Forces reached Trento and Udine and vitally, they entered the city of Trieste, this opened up this important sea port to the Allied forces and which in a few weeks’ time would be repatriating prisoners of war. During this time many of the Austro-Hungarian forces began to retreat towards the north and their homelands. Negotiations were difficult and at one time there was an Austro-Hungarians threat to withdraw from the negotiations, then on the 3 November the Austro-Hungarians forces accepted the Allies terms and a cease fire came into force at 15.00 hrs, on the 4th November 1918. The memorial stone to Lt Henry Biorn Homan was probably arranged when his parents paid a visit to the site of his death after the war. 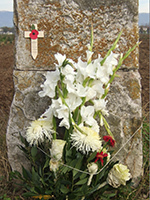 The memorial is positioned in the field, near to where Homan died and within sight of buildings that were used by the squadron’s motor transport. The inscription is in English and Africans. On the fourth of April 1918, Homan took off in Camel B5226, for reasons unknown the engine choked soon after taking off and crashed into a field just outside the perimeter of the aerodrome at St Pietro-in-Gu. 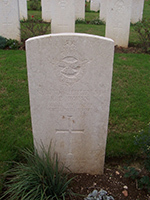 He is buried in the Commonwealth War Graves Cemetery at Montecchio Precalcino, plot 1, row A, grave 1. 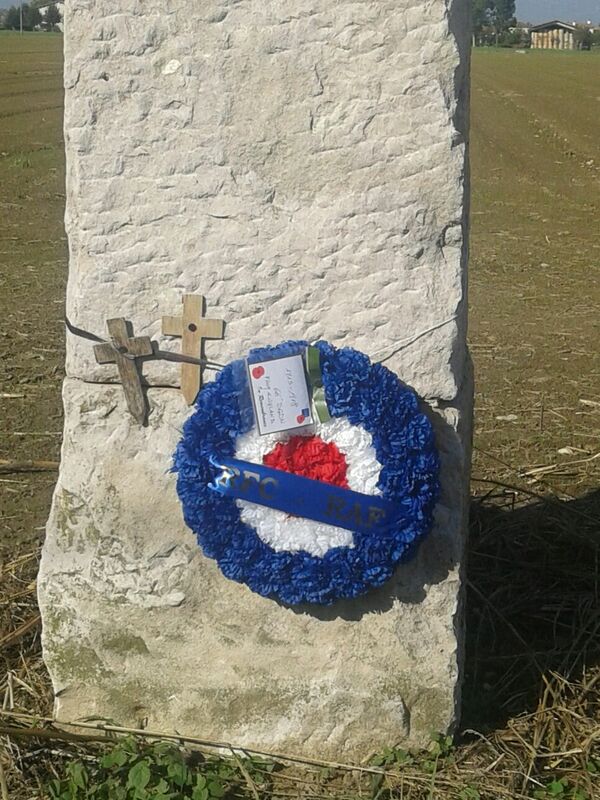 The wreath is not just to the memory of Homan, it is recognition of all the British forces who served and lost their fellow Airmen and comrades whilst stationed at St Pietro in Gu during world war one. The Memorial was erected in the 1920’s, probably when his parents, William and Helen who went to South Africa in 1901. They are recorded as returning to South Africa on the 23 October 1920, departing Southampton to the Cape on the Balmoral Castle, a Union Castle mail, steamship. The Homan’s travelled with their children, twelve year old son and two daughters, one aged fifteen and the other nine. My thanks to Nereo Gasparetto for all his help and friendship. As many will know 66 Squadron spent much of its time in Italy based at St Pietro in GU and I often felt that because the Allied war in Italy did not attracted much attention at Home that it is largely a forgotten theatre of war. I have for a number of years been sending a Royal British Legion Cross to put on Homan’s memorial, not only in remembrance of his sacrifice but also all the other men of 66 Squadron RFC and RAF who served and died in Italy. Flowers laid by the local Villagers in respect of Henry B Homan who was killed on 4 April 1918 whist on final approach to the Aerodrome. As this year is the 100th anniversary of the end of WW1 in Italy. I ordered this anniversary memorial wreath to be placed by my good friend Nereo Gasparetto, to remember all the British Officers and Men who served at St Pietro in Gu in 1917-19. 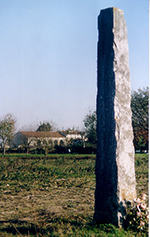 His grave at stone in Montecchio Precalcino Cemetery, Italy. Homan’s memorial and the buildings of the farm where the squadron was based for most of 1918. Another photo of the farm and in the distance is the Montello, a place he would have flown over many times. As can be seen in the photographs, every year some of the local people from the Village honour him with some flowers. You can also see in one of the photos the well know farm buildings that quite often appear in photographs of the time. My Thanks to my good friend Nereo Gasparetto for once again placing the cross on the memorial and sending me the photographs.